Every pet needs a little fashion in their life. Our pets all have their own personalities. Amplify your little diva or macho man with a fun bandana! Get them something that will get their tail wagging. 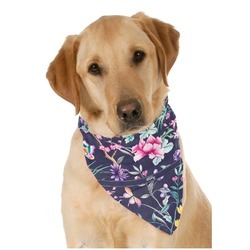 This beautiful pet bandana really is the perfect accessory. It is made from a silky feeling polyester and measures at approximately 23" x 23". Your personalization will be printed on a diagonal, so that you are able to read the personalization when folded into a triangle. This bandana fits best on large dogs, but can be folded smaller if there is no personalized text to fit smaller pets. Go into our design center to get started. Pick a fun pattern that matches the personality of your pet! Then choose a monogram or font to personalize the bandana. Write their name or a funny saying. Whatever you do, have fun! If you ever need help, just ask one of our customer service agents. We've got your back! Compare this bandana to our dog bandanas! This one is silky, flexible, and large. Our other Dog Bandana comes in different sizes and fits onto your pup's collar. Both are great choices, but one may fit your needs better than the other. Be sure to look through our Pet Accessories section to find any other accessories for your sweet pets.